Lunch Bugs Bags Will Make People Go Eeeww! Ever tried to creep out whoever sits in the same lunch table as you? If you haven’t but want to, go for these specially printed Lunch Bugs. 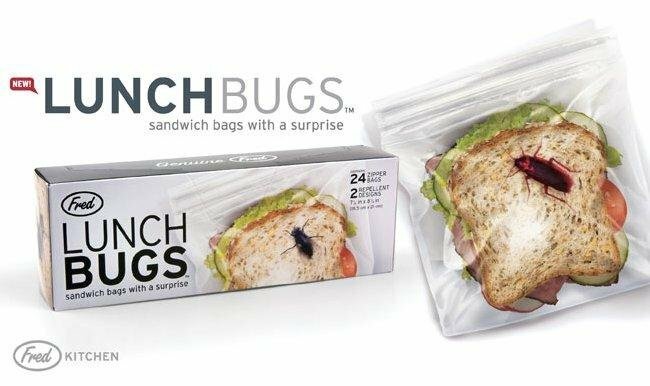 They’re sandwich bags with insects printed on them for mass (hysterical) effect. Yeah, of course it’s juvenile but thanks to our prevalent gaming culture the line between juvenile and adult is blurring. Ahem! Thanks to the wonderful people at Archie McPhee, a whole box of these uh, bags is now available for $6.95. Oh yeah! The product is actually aimed at those between the ages of 10-24. Usually the type who are prone to have their lunches stolen or tampered with by evil fellow humans. To avoid this unsavory experience, just show them how gross you are. Such is the thinking behind these wonderful Lunch Bugs. But take it from us, insects on your food don’t really taste as bad as most people think.